Just last year, the statistics department hired its first tenured female professor, Susan Murphy. Lauren Williams ’00 will join the math department next fall, the second tenured woman in that department’s history. Their hires reflect Harvard’s growing interest in the diversity of its faculty. For the last decade, the University has tracked its progress in recruiting and retaining faculty who are more inclusive in terms of race and gender; according to the newest annual faculty-diversity report, published today by the office of the senior vice provost for faculty development and diversity, 27 percent of tenured faculty are women as of last September—up from 26 percent last year and 21 percent in 2008. Underrepresented minorities (African Americans, Latinos, and Native Americans) make up 8 percent of tenured faculty—unchanged from last year and up from 5 percent a decade ago. These gains may sound small, but turnover among professors is extremely slow, so changes in the composition of the faculty occur in small increments each year. 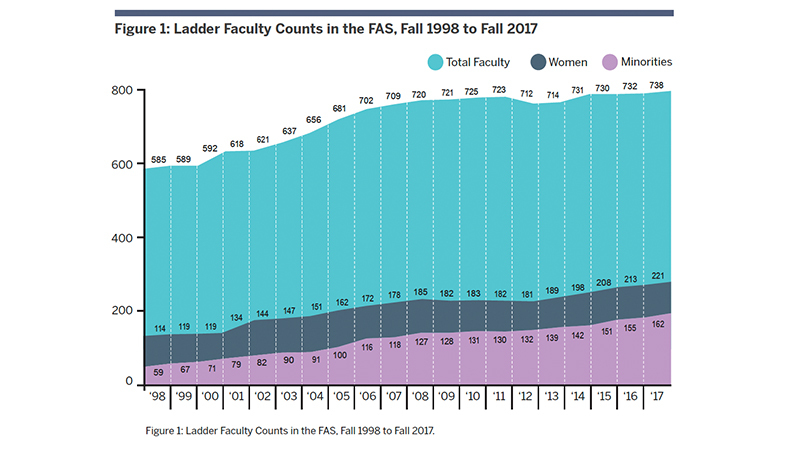 In the Faculty of Arts and Sciences (FAS), women represent 27 percent of tenured and 43 percent of tenure-track faculty members; underrepresented minorities represent 9 percent of both tenured and tenure-track faculty, and Asian-Americans,12 percent of tenured and 21 percent of tenure-track faculty. Of the 14 FAS faculty members who were reviewed internally for tenure in 2016-2017, nine were promoted, including six of nine men and three of five women. In December, a study led by Elena Kramer, chair of organismic and evolutionary biology, and Radhika Nagpal, professor of computer science, found that in science, technology, engineering, and mathematics (STEM) fields, 69 percent of female junior professors stayed long enough to come up for tenure review, compared to 84 percent of men. The report attributed the disparity to implicit bias against women, “institutional and structural barriers, such as problematic maternal/paternal leave policies, inadequate infant/early childcare on campus, and poor support for dual academic career couples that is substantially behind our peer institutions,” as well as to “persistent culture problems” in certain departments, including explicit sexism. Harvard’s most recent faculty climate survey, conducted in 2014, also showed that male and female faculty members spend about the same number of hours (60 to 70 per week) on academic work, but that women, particularly those with children, spend much more time than men on household work. It may not be a stretch to surmise, then, that many women find the demands of being a Harvard professor, when paired with their work at home, too difficult to manage over the long term. Singer also links the problem of retaining faculty women to the ferocious competition for female scholars among top institutions: “Everybody here is wanted by every other institution, and every other institution is making a push to diversify its faculty,” she said. “We want to make sure there are no push factors that are causing people to leave—that’s something that we need to deal with. But there is an external market for faculty, and the market for women in science is quite hot.” Part of the strategy of Harvard’s tenure-track system, she said, is to promote internal faculty retention. Part of Harvard’s wider strategy for recruiting and retaining top female scholars includes expanding support for childcare. “We have really ramped up our childcare investments,” Singer said. After persistent complaints from faculty members about the availability of daycare, the University has announced that it will open a seventh childcare center in Allston in 2021—a year after the new science and engineering complex opens there. Its six existing centers (which are Harvard-affiliated but independently run) currently have 380 slots. The University has also made access to slots for faculty members much easier: as of this year, Harvard professors have priority for 50 percent of the slots, and every faculty member who applied for a spot got one. Of course, the market for childcare services in Boston is hideously expensive. A place at a Harvard-affiliated center costs between $1,795 and $3,620 per month, depending on the child’s age. To defray some of those costs, the University provides scholarships ranging from $4,000 to $24,000 per year (awarded as taxable income) to ladder faculty and some senior non-ladder faculty, such as senior lecturers and preceptors. The funds can be used for Harvard’s childcare centers, an outside center, or even a nanny; the University disbursed $900,000 in scholarships in fiscal 2018, with an average grant of $13,000. Faculty from households earning up to $200,000 are eligible, but the program is not open to postdoctorate affiliates, most non-ladder teachers, graduate students, or others who might have children (though they can apply for a smaller program that awards up to $5,500 per year). “Childcare is expensive, and we have to target resources where we feel they’ll be most effective,” Singer explained. “The market for recruiting faculty is very competitive”—even for Harvard. The report and underlying data are available here.